This simple yet fun 1v1 soccer drill kids love. It's competitive, fun, and involves lots of shooting which is what almost every kid wants at soccer practice. - Set up this 1v1 soccer drill with your players in 2 lines, one on each post. - Have all of the balls behind the net with you. - You call "GO" and first player in each line sprints around their cone. - You throw a ball over the net into the middle of the 18 yard box. 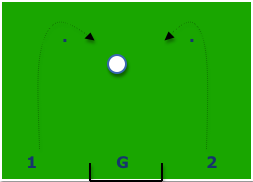 - Players corner around the cone and attack to the ball. - 1st player to the ball is the attacker, 2nd the defender. - Player should look to get a shot off quickly. - All shots should be on target. - Attacking player should use 1st touch to bring ball under control AND if possible should use that 1st touch to take the ball across the body of the defender. This essentially cuts of any angle the defender may have. - Have first 2 players in each line go at a time. - 10 minutes for this 1v1 battle.